Through combining music and meditation, University of Miami graduate Arianne Urban wants to bring empathy and humanity to the forefront of her work as an artist. For high school, she attended New World School of the Arts and performed in various orchestras outside of school, including with the Miami Music Project and the Greater Miami Youth Symphony. During college, she was involved with Sigma Alpha Iota, a women’s music fraternity, and immersed herself in the musical languages of jazz, bluegrass, and pop. After graduating in 2014, she moved to Chicago to attend DePaul University for a master’s in music. Within her first year, she became the concertmaster of the DePaul Symphony Orchestra and won the annual Concerto Competition performing Brahms’s Double Concerto for violin and cello with her colleague Sonia Mantell. During her time at DePaul, Urban completed a two-year residency with the prestigious Civic Orchestra of Chicago, an apprenticeship orchestra for the Chicago Symphony Orchestra. At the Civic, she advanced to a rotating concertmaster role and worked closely with Yo-Yo Ma, the orchestra’s creative consultant. It was during a lecture between Yo-Yo Ma and Chicago installation artist Theaster Gates that Urban’s idea for fusing mindfulness and music came to fruition. 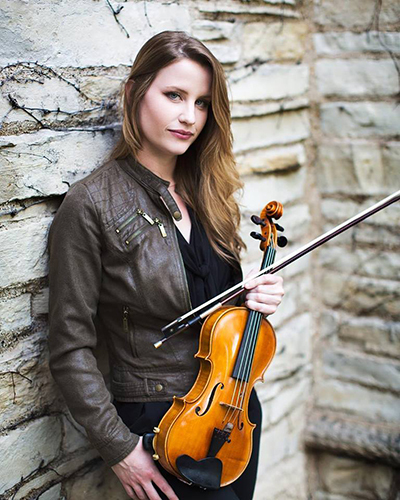 Currently, Urban is an active freelance professional violinist and private violin teacher. She has worked with world-renowned artists including Andrea Bocelli, Johnny Mathis, Katharine McPhee, and David Foster. She also regularly works with Chicago orchestral arranger Matt Jones and played on albums for Grammy-nominated artists Chronixx, PJ Morton, and Ledisi. Outside of music, she is passionate about meditating and higher consciousness learning. She is currently curating a mindfulness curriculum that will fuse her two passions — music and meditation — to teach others how to use the power of conscious awareness to transform their personal reality. Her short-term goal is to continue building a global musical network as a performer and use her connections to create collaborations that will bring light and healing to social injustices in the world today. Her long-term plans include expanding her social impact as a performer, meditation teacher, personal development coach, and world traveler.